1. Open the Safari browser using your iOS device. 2. Open the website Emu4iOS.net. 3. From this website, download the Shou App to your device. 4. Launch the Shou app on your device. 5. After opening the app, signup using your facebook or google account. 6. After you sign up and login, there will be 2 options available in this app. Start Broadcasting & Start Recording. 7. You can also adjust orientation, quality and timing of the video. 8. Click on start recording to start capturing the screen of your iPhone without the need to Jailbreak. When you start recording, a red dot will start showing up, which means recording. 9. To stop the recording, click on the red dot at the top of the screen. 10. Congratulations, you successfully recorded the screen of your iOS device without Jailbreak. Nokia, the country’s dominant handset player, is plotting to steal Apple’s thunder. The company is set to launch its latest high-end phone-the N96-which calls a ‘killer product’ on Tuesday in India, three days before the much-awaited 3G-enabled iPhone’s debut here. The N96 was tipped to be launched globally in October and this may perhaps be the handset maker’s first global launch in India. Industry experts say Nokia is rushing the N96 to India to counter the hype associated with the 3G iPhone, which will be offered by Bharti Airtel and Vodafone Essar. While Nokia is expected to launch the product in Delhi on Tuesday, the handset is likely to be available in the market from the first week of September. Nokia’s N96 is expected to be priced around Rs 35,000. In comparison, the iPhone is likely to cost about Rs 31,000 for the 8 GB version and between Rs 35,000-37,000 for the 16 GB one. Till date, Bharti, Vodafone and Apple have remained tight-lipped on iPhone’s pricing strategy in India. But if the iPhone is bundled with a carrier’s service, the price could be half this amount. Indian consumers, who have waited for months to own the iconic 3G-enabled Apple iPhone, will have to pay Rs 31,000 for the entry-level 8GB memory mobile phone and Rs 36,100 for a model with double the memory. Both Vodafone and Airtel will be launching the iPhone on August 22 and industry experts say bookings and pre-launch interest suggest that they would be able to sell over 100,000 phones in the next 12 months. Companies like Vodafone, which opened bookings for the phones in July, have already received booking requests of over 10,000 phones. These lower prices are possible because of the large subsidies that service providers are willing to provide to woo customers. In India however, neither company will offer a subsidy. However, the non-3G Apple iPhone — which was launched by the company earlier — is available in the Indian grey market at around Rs 20,000, down from Rs 24,000 a few months ago. 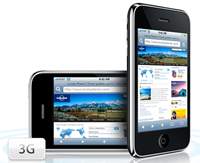 The 3G iPhone will have faster downloads, an in-built GPS system and direct connections to YouTube, among other features. Meanwhile, leading handset makers like Nokia, Motorola and Samsung have stepped up their R&D efforts to introduce feature-rich phones in India to compete with iPhones. 8GB iPhone to cost Rs 31,000? The wait finally seems to be over. According to reports, the pricing of the most-awaited gadget Apple iPhone, set to be launched in India on August 22, is out. Reports indicate that the 8 GB version of the 3G iPhone will cost Rs 31,000, while the 16 GB version will cost between Rs 36,000–37,000. The above pricing is exclusive of the rental plan the phone will come bundled with. Last week Bharti Airtel and Vodafone announced that they will launch iPhone on August 22. In a statement, Bharti said that millions of Airtel subscribers will be able to purchase the iPhone at Airtel’s Relationship Centres from August 22. “iPhone has been an iconic technological revelation of this year and Airtel has been at the forefront of innovation and customer delight in the Indian telecom sector,” Sanjay Kapoor, President, Bharti Airtel mobile services, said. iPhone is embedded with all 3G features and is twice as fast as the existing mobile phones. The phone also has in-built GPS system, which facilitates as navigation and positioning tool. Apple iPhone, the touchscreen handset that seems to have acquired a cult status in the US and other western countries, is finally hitting Indian shores this month. While Bharti Airtel has announced that it will launch iPhone on August 22, Vodafone may steal its arch rival’s thunder by launching the eagerly-awaited phone a few days earlier on August 18. In fact, Indiatimes Infotech was the first to report that Vodafone will launch iPhone in India in August. “Introducing iPhone in India further underscores Bharti’s commitment to enrich the communication experience of Airtel users,” Kapoor said. Leading cell phone makers like Nokia, Motorola and Samsung have stepped up their R&D efforts to bring feature-rich phones in India to compete iPhone. On August 1, 2008, India joined the elite list of countries to announce a policy for third generation mobile service that will enable customers to enjoy voice, video, data and downloading facilities on their mobile phones. The much-awaited 3G policy would allow up to 10 players in a service area including foreign companies. India has 60 Mhz of 3G spectrum available. The auction will take place in the 2.1 Ghz band. The government has set a base price of Rs 2,020 crore (Rs 20.20 billion) for each bid for a pan-India license. Initially, there will be three to five operators to sell the 3G services, including state-run BSNL and MTNL. The state-run telecom firms have an edge to start the 3G services earlier than others as they do not have to bid for the spectrum as they only have to match the highest bid in their respective circles. When will 3G services in India start? There is no firm date set for the auction of 3G spectrum, but it is likely to take place before February 2009 since the government may need the money to keep its deficit within control; current estimates put the initial entry fee bids that the government will get at anywhere between Rs 30,000 crore (Rs 300 billion) and Rs 40,000 crore (Rs 400 billion). In that case, by about December 2009, India may get broadband-type internet speeds on mobile phones. That, in turn, will allow users to view movies on their mobile phones, conduct video telephony while on the move, and so on. 3G is short for third-generation mobile telephony services. 3G guidelines will revolutionise the country’s cell phone services, clearing the way for high-speed mobile connectivity in India. 3G phones work in higher bandwidths of 15-20 MHz. Currently, mobile phones work on 2G or 2.5G, and use 30-200 KHz bandwidth. Bandwidth is a measure of the width of a range of frequencies used while transferring data from one point to another and is measured in hertz. How do 3G services help us? All telecom operators are waiting to launch 3G in India to cash in on revenues by providing high-end services to customers, which are voice data and video enabled. 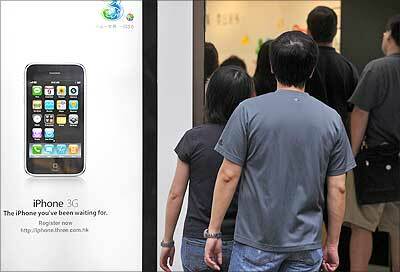 India lags behind many Asian countries in introducing 3G services. Packet-based data provides several advantages over the existing circuit-switched techniques used for carrying mobile voice. It allows higher call volumes and support for multimedia data applications, such as video and photography. Users will be charged on how much data they transmit, not on how much time they are connected to the network, because with 3G you are constantly online and only pay for the information you receive. There is good news for all mobile phone users in India. The roadmap to introduce mobile number portability that will give cellphone users the freedom to choose their service provider while retaining their numbers has been readied too. With 3G mobile services, which provide high-speed downloads of data, movies and videos, around six month away, mobile phone makers are getting ready to offer handsets for as little as Rs 3,500, against the currently available minimum price of over Rs 8,000. Chinese telecom giant Huawei Technologies is already in talks with leading Indian operators of GSM mobile services to sell a 3G entry-level phone within $80 to $100. South Korean electronics giant LG Electronics has the KU250 3G phone model, which is positioned as one of the cheapest phones in this category around the globe. “We will launch an adaptation of this model in India for around $100. Motorola India also expects prices to fall dramatically. It expects the prices of phones to come down to Rs 4,000-5,000. Motorola has about three 3G models that range from Rs 14,000 to Rs 19,000. Also, contrary to common belief, 3G will not be a premium service. Operators said a start-up package could cost around Rs 299, which is roughly what consumers pay for a fixed broadband service. Unlimited downloading may require subscribers to pay Rs 500 to Rs 1,000 a month. What do 3G handsets look like? 3GSM phone designs are based on functionality and customer needs. To allow new Internet and multi-media services, bigger viewing screens are the norm. Thus, the size of 3G is likely to be bigger, yet some mobile phone manufacturers could offer small handsets too. Can you receive 3GSM services from your current mobile handset? 3GSM is a new technology and thus you cannot access 3G multimedia services using existing GSM handsets. So you will need to upgrade your mobile to be able to use these services. What exactly do 3G spectrums do? Third Generation or 3G is a generic term used for the next generation of mobile communication systems. With 3G spectrums, your mobile can work for you even while you sleep. It sets your travel schedule and checks for jams along your route, whether you take the car/bus or the train. It can double up as cash and plastic money, a one-instrument payment system to pay for your tickets and purchases by simply texting the bank. It can be your one-stop entertainment box that holds music files, downloads programmes you love while you’re on the move. It can work out what to do with incoming phone calls and messages — direct voice calls to voicemail when you are in a meeting, for instance, but providing a discreet text summary of the caller and the nature of the call. Spectrum refers to a range of radio frequencies. The bandwidth of a radio signal is the difference between the upper and lower frequencies of the signal. For example, in the case of a voice signal having a minimum frequency of 200 hertz (Hz) and a maximum frequency of 3,000 Hz, the bandwidth is 2,800 Hz (3 KHz). The amount of bandwidth needed for 3G services could be as much as 15-20 Mhz, whereas for 2G services a bandwidth of 30-200 KHz is used. Hence huge bandwidth is required for 3G. How is 3G different from 2G and 4G? While 2G stands for second-generation wireless telephone technology, 1G networks used are analog, 2G networks are digital and 3G (third-generation) technology is used to enhance mobile phone standards. While 2G is focused on voice, 3G supports high-speed data of at least 144 kbps enabling broadband Internet access on the mobile, and ‘triple play’ features like mobile TV and converged communication services. 3G helps to simultaneously transfer both voice data (a telephone call) and non-voice data (such as downloading information, exchanging e-mail, and instant messaging. The highlight of 3G is video telephony. 4G technology stands to be the future standard of wireless devices. Currently, Japanese company NTT DoCoMo and Samsung are testing 4G communication. Which companies got 3G license in India? 3G spectrum has been provided to GSM players like Bharat Sanchar Nigam Limited, Mahanagar Telephone Nigam Limited, Bharti Airtel and Vodafone Essar (then Hutch) to carry out an interface check on a non-commercial basis ahead of the start of 3G mobile services. As per the guideline, any licensed telecom operator can bid for 3G spectrum and the radio waves will be auctioned in 5-10 blocks depending on the availability. Each successful bidder will be allocated only one block in a service area. Spectrum will be auctioned in the 450 Mhz, 800 Mhz band for EVDO (for CDMA players) and in 1900 band when it is available. What led to spectrum imbroglio in India? The Telecom Regulatory Authority of India, in its recommendations, had suggested an increase in the subscriber norms by two to six times. However, with GSM operators opposing the move, the issue was referred by the DoT to its standards setting organisation, the Telecom Engineering Centre. The latter recommended hiking the minimum subscriber number even beyond what the Trai had suggested. Earlier formulae had suggested the subscriber number be a mid-point between what the Trai and TEC suggested or a 25 per cent ‘tightening’ of the existing policy. What are the issues regarding 3G for providers and users? 3G has successfully been introduced in Europe. But several issues continue to hamper its growth. High spectrum licensing fees for the 3G services. Huge capital required to build infrastructure for 3G services. Health impact of electromagnetic waves. Prices are very high for 3G mobile services. Will 2G users switch to 3G services. Takes time to catch up as the service is new. In how many countries does 3G exist? There are about 60 3G networks across 25 countries. In Asia, Europe and the United States, telecom firms use Wideband Code Division Multiple Access (WCDMA) technology. The WCDMA standard provides seamless global evolution from today’s GSM with support of the worlds’ largest mobile operators. WCDMA technology is built on open standards, wide ranging mobile multimedia possibility, and vast potential economies of scale with the support of around 100 terminal designs to operate 3G mobile networks. 3G services were introduced in Europe in 2003. In which country was 3G spectrum first introduced? Japan was the first country to introduce 3G on a large commercial scale. In 2005, about 40 per cent of subscribers used only 3G networks. It is expected that during 2006 the subscribers would move from 2G to 3G and upgrade to the next 3.5 G level. The success of 3G in Japan also shows that video telephony was the killer application for 3G networks. Downloading music was the biggest draw in 3G services. India, which has 287 million wireless subscribers, saw its mobile user base grow 25 times in the last five years making it the second largest wireless market in the world after China. Vodafone and Airtel started pre-registering customers for the iPhone 3G this week, and ever since, offices and blogs have been abuzz with discussions on what Apple’s much-awaited product will be priced at. Many think it will be just a shade over Rs 8,000 — the rupee equivalent of the price in the US, which is $199. Now, that’s a fantastic price for the 8GB product, and will certainly have every competitor worried. Nokia’s 8GB N95 smartphone, for instance, is priced at well over Rs 25,000, and its new N96 is expected to come at over Rs 36,000. But we think the iPhone, expected to hit the Indian market in September, will be priced substantially higher than Rs 8,000. The $199 price is a hugely subsidised one, subsidised by the US operator AT&T. Market researcher iSuppli has just estimated that mobile phone service providers are subsidising each handset to the extent of $300. Some other analysts think the subsidy is higher at $350 per unit. In other words, the actual price that AT&T pays to Apple for each iPhone unit is $499, going by the iSuppli estimate. Vodafone and Airtel are unwilling to talk about the price they will offer the iPhone at, but Bharti Airtel CEO Manoj Kohli told TOI there is no question of subsidising the handset in India. “US operators are able to subsidise handsets because they can make up for that with their call charges. They charge rates like 25 cents a minute. In India, the charge is 1.5 to 2 cents a minute,” Kohli said. In the absence of a subsidy then, the handset could be priced at $499 or a little over Rs 21,000 (governmental levies on mobile phones in India are marginal). Unless Apple chooses to offer the iPhone at lower margins to countries like India. iSuppli estimates it costs Apple just $173 to produce the latest version (excluding the cost of software development, shipping, distribution, packaging and accessories included with each iPhone). So it enjoys a huge margin on the product. We’ll have to see if Apple’s CEO Steve Jobs is willing to sacrifice some of that. But any which way, even at a price of Rs 21,000, the iPhone looks certain to sizzle the handset market.